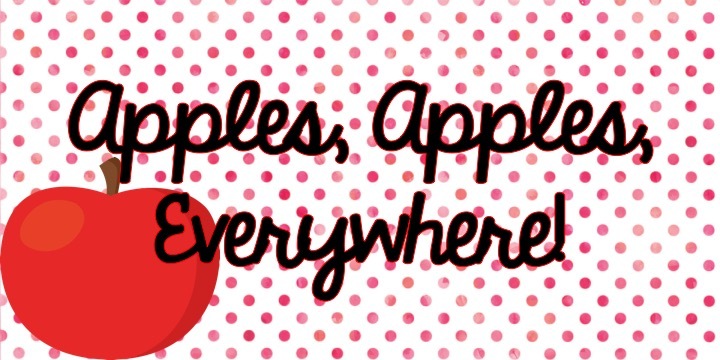 Curriculum and Coffee: Apples Apples EVERYWHERE! Hi!!! I am coming to you bright and early on a Saturday morning. I have so much to do, but here I am writing a long overdue blog post. Just because I can! Oh the pleasures of being an adult. We are headed back to our hometown later today to visit my sister, her husband, and my ever growing cute little nephew Max! I am very excited to see them and their new home. Traveling does lend itself to a busy day though. I still have that term paper looming over my head, and not that I am finally finished with report cards that's the next big thing hovering overhead. Well... Anyways, onto the fun! We were able to break away from our traditional text and study apples. It was SO fun! Our week started off with a fun experiment seeing what would keep an apple from turning brown. We tested water, vinegar, lemon juice, and milk. I promptly forgot to take pictures, but in the end we found out the the lemon juice (even though it all dried up!) kept our apple from turning brown. We made observations, predictions, and tested hypothesis. We also read about the seasons of an apple tree and then made awesome books! These books were SO cute! I had these great tree cut outs and they had to show what the tree looks like at each stage of development. They also had to write one sentence on each page about what was happening. I am SO proud of my kiddos for doing such a great job on them! We taste tested apples to see if we preferred green or red, and made apple diagrams to label all of the parts of an apple. Check out their awesome writing! Towards the end of the week we made apple sauce! We watched how apples turned from a solid to a liquid and learned about measuring and mashing! It was SO much fun! To end our week we conducted our final experiment... Do apples sink or float??? And guess what, they float! We found out by Bobbing for Apples! We had the BEST week! Teaching like this reminds me why I got into teaching. We were able to do so many fun things that made meaningful connections with each student. Apples got me really excited for... BATS!